If we have a King suite or Queen room available for the same day or within the next three days, you will receive 25% Off the posted rate on your first night and each additional nightstay. Last Minute Getaway rooms are for same day arrivals or for reservations made no more than three days before your requested arrival date. Call 928-204-1942 to inquire about our last minute, getaway rates. Not available with other discounts, online bookings, third party bookings, prior bookings or holidays. You must call to get this deal. wholesome Breakfast and Romantic Dinner starting at $650+. DINNER or LUNCH VOUCHER valued at $50.00 for Rene's restaurant, one of Sedona's premier fine dining restaurants located in the world-renowned Tlaquepaque shopping village. Enjoy a delicious homemade decadent welcome treat courtesy of The Lodge of Sedona's Executive Chef. Walk our magical meditative Labyrinth and explore our two beautifully landscaped acres of private estate grounds. This two night "ROMANTIC COUPLES GETAWAY PACKAGE" starting at ONLY $650 (+taxes) per couple for select King Suites. Not valid with third party bookings, other specials, discounts, packages or prior bookings. Limited Availability so don't wait! Package includes best available King suites excluding Red Rock Crossing, Mission Grande, Whispering Winds, and Meadow Breeze (additional charges apply for these rooms). 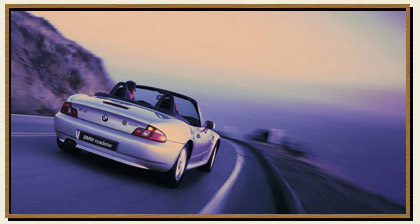 Simply call 928-204-1942 or Book online. Your adventure includes a Balloon Ride for two; three days and two night's accommodation in a luxury King Suite; wholesome breakfast.. The Lodge at Sedona invites you to explore one of the seven natural wonders of the world, The Grand Canyon. Your package includes two nights in one of our comfortable King suites. Enjoy our wholesome breakfast each morning. Stroll our relaxing grounds and walk our meditative labyrinth. 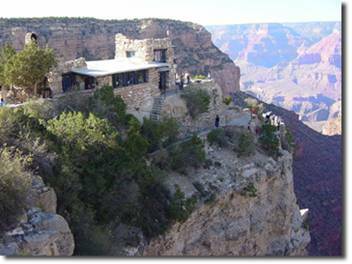 Your Grand Canyon tour begins as you……. All this for the special price of $1,445. plus tax. Not valid with third party bookings, other specials and discounts. 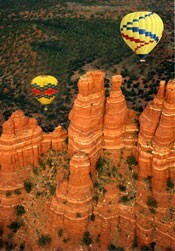 Package includes best available king room excluding Red Rock Crossing or Mission Grande. 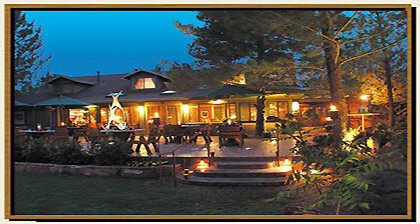 Simply call 928-204-1942 to book your reservation. FLY FISHING ADVENTURE PACKAGE for TWO! Come and Catch the Big One with Us! Stay with us in one of our luxury king suites and fish for rainbow, wild and brown trout in beautiful Oak Creek for an adventure you will not soon forget. The Fly Fishing Adventure Outfitters will pick you both up at The Lodge at Sedona and wisk you away for a four hour fly fishing adventure. 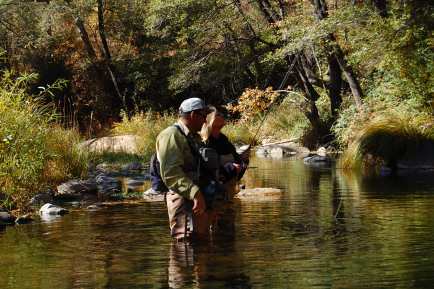 You will learn the art of fly fishing while taking in the beauty of the Oak Creek Canyon. You will also be provided with all the gear you will need to catch that big one! This special package includes two nights luxury King Suite accommodations, wholesome breakfast, plus your half-day fishing adventure for two. How exciting is this!! You will also enjoy our beautifully landscaped property, and our on-site meditative labyrinth. This package is based on availability and is not available with other discounts, third party bookings, prior bookings, or holidays. We suggest you book your adventure two to three weeks in advance to insure availability. Fishing license required (may be purchased from T.H.O. for $20. Please inquire with our Guest Service Innkeepers). Package includes best available King suites excluding Red Rock Crossing and Mission Grande. 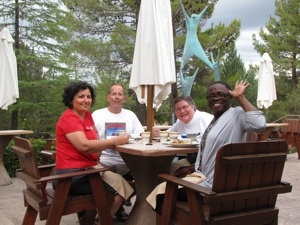 Our Retreat is a nutritional program that utilizes the body's own mechanism in the support for better health. 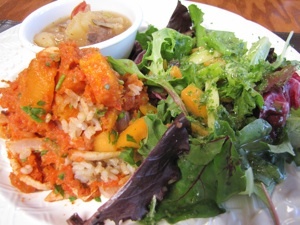 Our Advanced Therapy is nutritional and rebuilding program. It consists of flooding the body daily with nutrients from about 15-20 pounds of organically grown fresh fruits and vegetables daily. Advanced nutritional therapies to support the cleansing process. As a result of cleansing and increased oxygenation, cellular regeneration of all organs occurs, in particular that of the liver, and the immune system to restore them to its optimal function. Please contact us to discuss what we can do for you.